In 2001, I had an eye twitch for 3 months after the 9/11 event, and teaching yoga in a boys prison camp. The twitch was so annoying and it only went away when I ran vigorously on the canal path along the Delaware River. 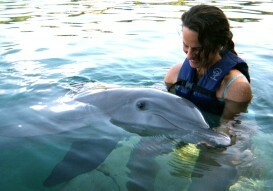 So, I went on a vacation to Tulum, MX with my yoga friend John F. and swam with some amazing dolphins. It was his birthday gift to me. I was so touched by their gentleness and compassion. I cried like a baby at dinner afterwords. The Mayan waiter, Ramon, was really the manager at Zamas Restaurant on the beach, but was filling in that night because they were short-staffed. Ramon was understanding, and listened to my glassy-eyed dolphin tourist story of that day with a big smile and kind eyes. One year later, on yet another Tulum vacation, I ended up getting shown a piece of property in Tulum town from that same Ramon, and buying it with cash over coffee! His uncle was the owner, and the mayor of the town. And so goes the circular journey of magic in this life! It seems that anything very significant that has every happened to me, I realize has happened with little or no effort on my part. Heavy heart, weight of my body on the matress, nauseous, waiting for something to happen. Suspended. Vacant, weepy, wispy, listening to my longer exhalations. Feeling vulnerable eating alone at the cafe today. Abandoned, but by whom? I trace the feeling inward and backward, and back, and back, but all I find is pure sensation and a few childhood memories of being home alone sick with strep throat. Why did I wake up to this today? It’s just a day like any other. The kitten wants to eat, and is trying every mischievous trick he knows to distract me from my pursuit of lonely sensation. Let the feelings be there.